25th anniversary edition of the band's landmark, platinum certified album on vinyl. Mixed by Brendan O'Brien. Includes three bonus alternate mixes of "Say Hello 2 Heaven", "Wooden Jesus" & "All Night Thing." 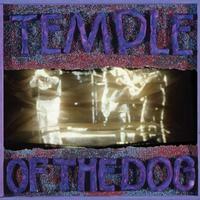 Temple Of The Dog was a collaboration between members of Soundgarden (Cornell & Cameron) and Mother Love Bone (Gossard & Ament), initiated as a tribute to Mother Love Bone's vocalist Andrew Wood who died of a heroin overdose in March, 1990 — two weeks before the release of MLB's debut album, Apple. The group's one and only album also featured the first recorded appearance of Eddie Vedder, who contributes backing vocals on several tracks. Vedder had recently moved from San Diego to Seattle, and became friends with the band members during the recording of the record. Soon after the Temple Of The Dog sessions, Gossard, Ament, McCready and Vedder went on to form Pearl Jam.